Cameleons are sophisticated genetically encoded fluorescent probes that allow quantifying cellular Ca2+ signals. The probes are based on Förster resonance energy transfer (FRET) between terminally located fluorescent proteins (FPs), which move together upon binding of Ca2+ to the central calmodulin myosin light chain kinase M13 domain. Most of the available cameleons consist of cyan and yellow FPs (CFP and YFP) as the FRET pair. However, red-shifted versions with green and orange or red FPs (GFP, OFP, RFP) have some advantages such as less phototoxicity and minimal spectral overlay with autofluorescence of cells and fura-2, a prominent chemical Ca2+ indicator. 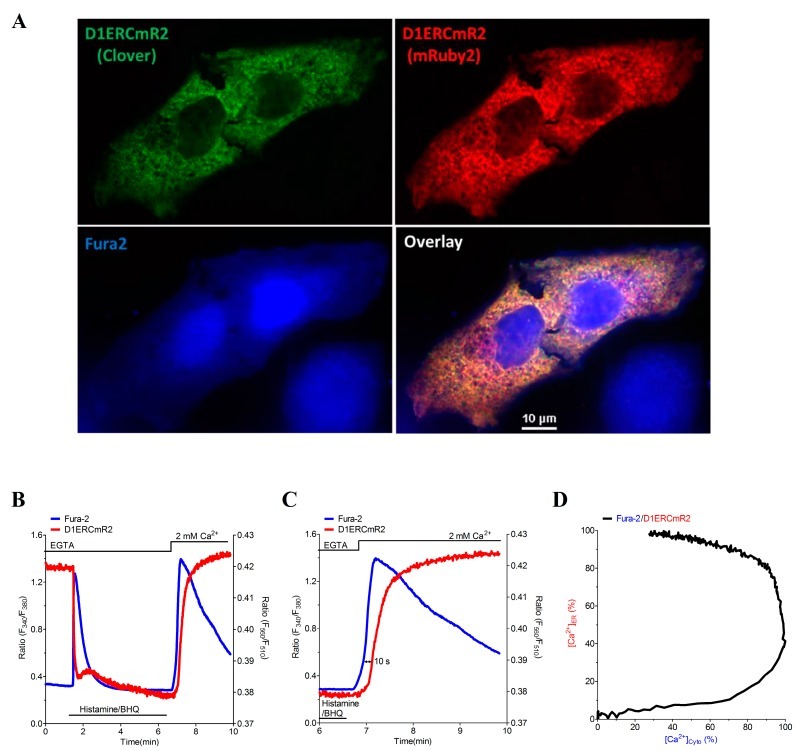 While GFP/OFP- or GFP/RFP-based cameleons have been successfully used to study cytosolic and mitochondrial Ca2+ signals, red-shifted cameleons to visualize Ca2+ dynamics of the endoplasmic reticulum (ER) have not been developed so far. In this study, we generated and tested several ER targeted red-shifted cameleons. Our results show that GFP/OFP-based cameleons due to miss-targeting and their high Ca2+ binding affinity are inappropriate to record ER Ca2+ signals. However, ER targeted GFP/RFP-based probes were suitable to sense ER Ca2+ in a reliable manner. With this study we increased the palette of cameleons for visualizing Ca2+ dynamics within the main intracellular Ca2+ store.